Kayaking can be a fun and adventurous activity but like every sport you must start somewhere. Beginners often rent kayaks during their lessons, however you might like your own kayak to get used to and learn until you can get off on your own. Adjustable foot rests and back rest for extra. Suitable for, river, lake and also sea kayaking. 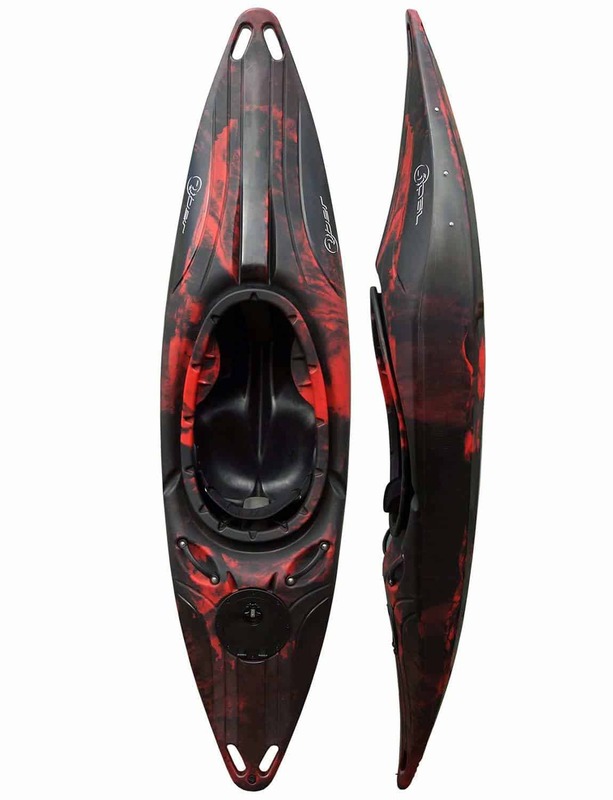 Advanced Elements Unisex Adult Strait Edge Kayak. Very lightweight, so it is easy to get around, carry and store. Intex Challenger K1 Kayak - One Person Kayak. Not too expensive for those looking for a cheaper starting point. What type of Kayak should you choose? There are many different choices of boats even for those just starting out. The kayak you should choose will depend mostly on where you will be riding and what type of ride you prefer. These types of kayaks are great for those just wanting a bit of fun in less challenging waters. They are short boats in comparison to others at 6.5 to 8 feet in length. If you are more interested in doing a bit of surfing and trying some tricks, then the freestyle boat is a style you might consider. At over 9 feet in length, as the name suggests these are the longest kayaks you could choose. Although they have quite high volume, the length makes them a little less stable and manoeuvrable than shorter boats. These are a good choice for longer expeditions due to the space for gear, however can be difficult to handle for beginners. Best when paddling down river, these river runner boats are a good for going fast and give you control through the straights. They come in lengths between 7.5 and 8 feet and feature a flatter frame. Due to the stability, this type of kayak is regraded as a good beginner’s boat for paddling easily in moderate waters. These boats have a large volume which means they can handle speed and difficult water. Creek boats are made for large waves and a bumpy ride. The lengths of the boats are between 7.5 and 9 feet and with the width makes them quite large boats to handle. If you are looking to kayak in some tough rivers, then this type could be a good choice. Now you know what type of boats are available you can review the characteristics available too. It is best if you know what type of white water before you consider the characteristics, then you can choose the right ones for the conditions. Remembering as a beginner you will be starting out in calmer waters helps. These are the part of the hull that sits just under the waterline and come in both hard and soft designs. Hard chines provide more control and agility but can get caught on rocks and catch the water flows more quickly. Soft chines are gentler but require more steering and control from the paddler. The rocker is simply the curve of the boat. The general rules for the rocker the more rocker, the more manoeuvrable your boat will be. The flatter your boat the better it will be at riding straight and at speed. Again, depending on what type of water you will be riding will depend on the type of rocker that will be best. When it comes to the hull shape, there are two designs the planning hull and the displacement hull. Agile in rough conditions, a planning hull has a flat bottom making the boat plane across the water. The displacement hull is more rounded and cuts through the water more deeply and easily and also more forgiving with beginner errors. There are a few other things to think about when choosing a beginner kayak. Do you plan on using your fishing kayak for years to come? General wisdom is that kayaks priced under $350 are not durable, and should more-so be considered disposable. Higher quality kayaks tend to hold their value better long-term. As you will have a difficult time finding advanced model kayaks for under $600, the main question is whether you want to go entry or intermediate level. Entry-level kayaks have enough features to get you out there, while intermediate models differ most in that more careful consideration is put into the design. This is a feature that is popular in stopping riders from capsizing. They offer a water-tight seal to keep the cockpit from taking on water and rolling underwater. Best Whitewater Kayaks for Beginners Reviews. There are lots of whitewater kayak for biginner could possibly choose from but we have done an expansive research to reduce the stress of choosing the best one available. We will be mentioning some of them in subsequent paragraphs. 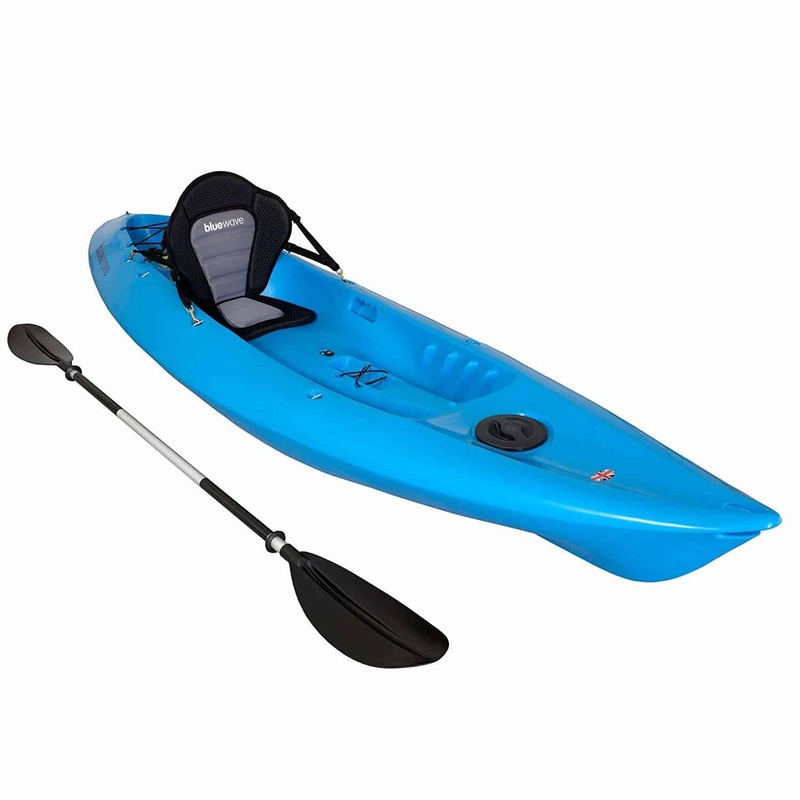 This kayak can handle a wide range of white-water types and has a large but stable design for beginners. It is a little pricey so might be a bit much if you are just starting out. Features a wide hull for excellent stability. At 8.5 foot, the volume is high and stable which is good for beginners learning to paddle. Can have some problems for beginners in fast waters. It has carry-handles that cannot be removed which is good for transporting but can get in the way in the water. Bluewave Dart Sit on Top Touring Kayak. Another all-rounder, this kayak is suitable for those who may want a comfortable ride for longer distances, on multiple water types. Comes with a paddle and seat pad as part of the package. High volume for extra stability and difficult to capsize. Large dry storage compartment, excellent for long journeys. Not the fastest kayak available due to the wide frame. The high volume reduces manoeuvrability is faster currents. 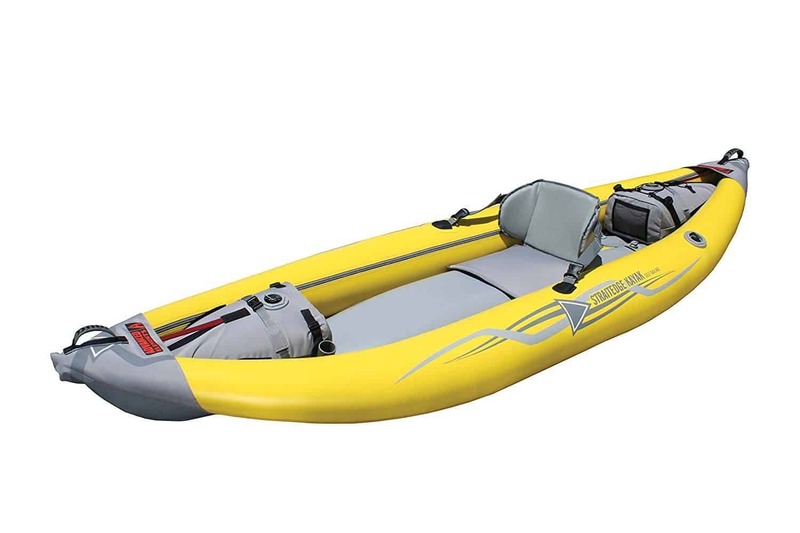 This is an inflatable type kayak that you need to set up prior to hitting the water. The Strait Edge Kayak is made for white water and fast currents. The shape and aluminium bow make it easy to cut through water. The large rocker and short length means increased manoeuvrability through tough waters. Beginners might find this kayak difficult to handle in fast water. Might be dried out thoroughly to prevent mould growth each time it is used. 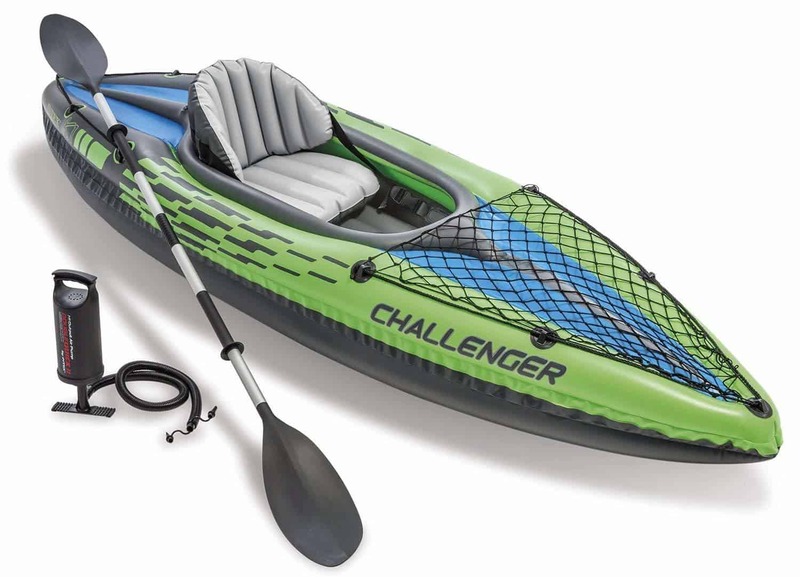 Another inflatable, the Intex Challenger offers value for money for the beginner kayaker. It is lightweight and suitable for good weather conditions. Lightweight and easy to store, carry and set up. Comes complete with paddle and pump as part of a package. Only usable in calmer waters, not good in fast flowing rivers. If you are serious about kayaking, then the Bluewave Dart Sit on Top Touring Kayak has everything you are probably looking for. The sturdy design and high-volume river runner can be handled by novices yet has the rocker and hull shape to handle moderate waters.